St Joseph’s Catholic Church in Colorado has experienced continued growth since its humble beginnings in 1907. After two additions, the diverse church now boasts over 10,000 square feet and their congregation with their time, talents, and treasures. With this in mind, church leaders knew they needed to create a flexible space to accommodate the needs of their congregation today and for years to come. Thus, began their search for a solution. After four months of research, their design upgrade came with the purchase of Screenflex Portable Room Dividers. St. Joseph’s originally used permanent room dividers in parts of their facility. However, making the switch from permanent room dividers to Screenflex movable walls offers an affordable and flexible solution to their existing space. 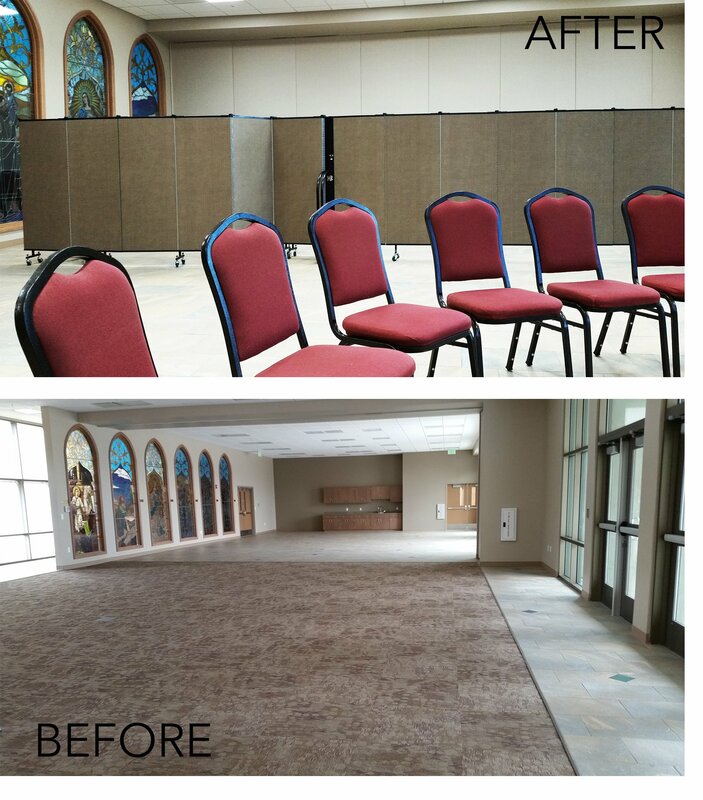 In contrast to permanent dividers, Screenflex dividers allow the St. Joseph Catholic Church to move the dividers around the room to accommodate different groups that are meeting at the same time. Better yet, Screenflex dividers arrive fully assembled and ready to use. Therefore, they can create their desired space once the room dividers arrive. The church quickly discovered how versatile Screenflex portable walls are. As a result, they found other uses for their movable walls beyond their intended use. “Originally we wanted to subdivide our large room into even smaller areas so that multiple groups could use the room at the same time,” remarks Carol. Although this is still their main purpose and use of the room divider, they use the dividers to display information, protect a stained-glass wall from damage, create a decorative banquet backdrop and so much more. With Screenflex fabric room dividers, you can tack, pin or staple items directly to the fabric surface. We suggest using a Screenflex Artwork Hanger when displaying larger, bulkier items.